Tinhorn Creek Vineyards’ Chairman Kenn Oldfield (right) presented a $6000 cheque on behalf of the winery’s Celebrate the Arts charity to Oliver Elementary School teacher Connie Thomson (left) during The Harpoonist And The Axe Murderer’s sold out concert at Tinhorn Creek Vineyards on Saturday August 29th. Tinhorn Creek launched Celebrate the Arts in 2015 and this is their second $6000 cash donation to the program, which supports local schools including Oliver Elementary School, Tuc-el-Nuit Elementary School and South Okanagan Secondary School to fund extra music, drama, dance and fine arts programming for students. Tinhorn Creek Vineyards has also committed to in-kind donations, such as the use of their outdoor amphitheatre, tasting room and barrel cellar for performances and rehearsals, and use of the guest suite for visiting performers. The 2016 Tinhorn Creek Canadian Concert Series wrapped up this weekend with another sold-out performance, this time by well known Canadian alternative rock group 54-40. 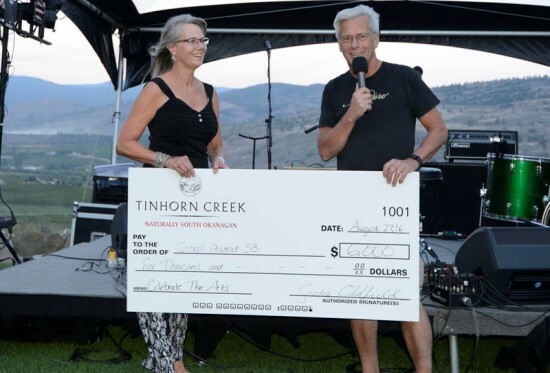 Tinhorn Creek remains committed to Celebrate the Arts and has pledged proceeds from next season’s Canadian Concert Series, as well as a portion of Tinhorn Creek’s annual income, to continue to support the program. Visit www.tinhorn.com or call 250.498.3743 or 1.888.484.6467 for more information.